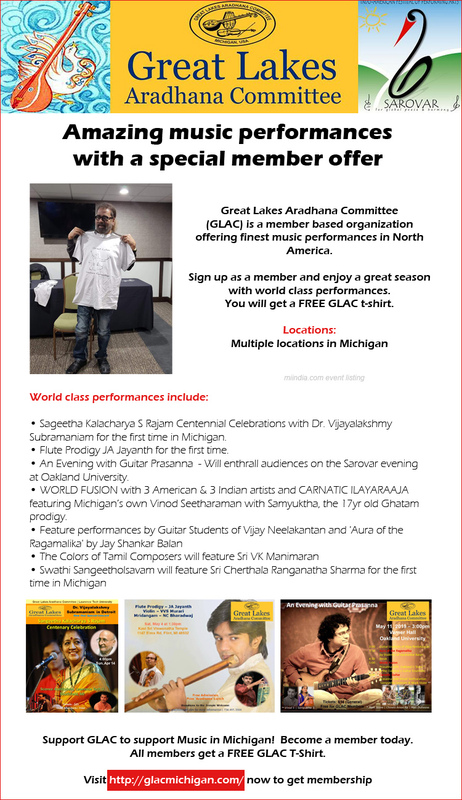 Great Lakes Aradhana Committee (GLAC) is a member based organization offering finest music performances in North America. Sign up as a member and enjoy a great season with world class performances. You will get a FREE GLAC t-shirt. Sageetha Kalacharya S Rajam Centennial Celebrations with Dr. Vijayalakshmy Subramaniam for the first time in Michigan. Flute Prodigy JA Jayanth for the first time. An Evening with Guitar Prasanna - Will enthrall audiences on the Sarovar evening at Oakland University. WORLD FUSION with 3 American & 3 Indian artists and CARNATIC ILAYARAAJA featuring Michigan’s own Vinod Seetharaman with Samyuktha, the 17yr old Ghatam prodigy. Support GLAC to support Music in Michigan! Become a member today. All members get a FREE GLAC T-Shirt.